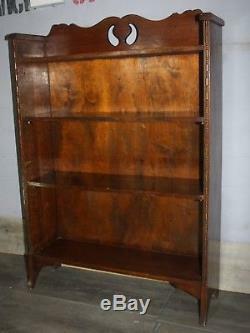 This is a very elegant small open bookcase. 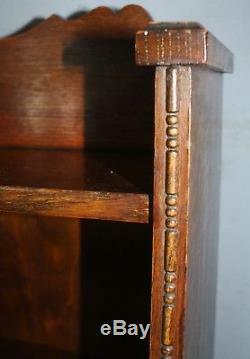 It is made in solid oak with a panel back and was probably made in the last sixty years. 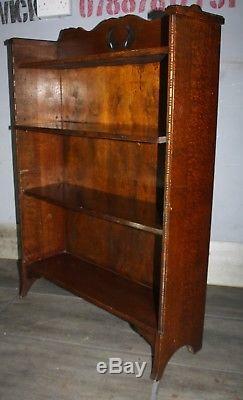 The bookcase has elements of the Arts and Crafts design about it with shaped feet, fretwork detailing to the back which is shaped and egg and dart detail to the leading edges. The bookcase has adjustable shelving and the solid oak is a good rich polished colour. The bookcase is in good vintage condition. Minor wear as you would expect in a vintage piece. This is a lovely bookcase. It won't overpower your space but will hold a lot of books. It is elegant enough to be in a principal room, study or even a bedroom. The bookcase is 41 inches high and 33 inches wide and 9 inches deep. 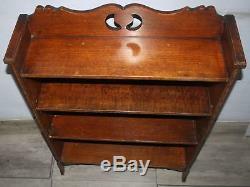 The item "Good small solid oak Arts and Crafts bookcase bookshelves. Will post" is in sale since Sunday, August 19, 2018. 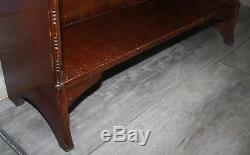 This item is in the category "Antiques\Antique Furniture\Bookcases\20th Century". The seller is "warwick141" and is located in Mold.